Bell P-59B Airacomet at the National Museum of the United States Air Force, Dayton, Ohio. The Bell P-59 Airacomet was the first American jet fighter aircraft, designed and built by Bell Aircraft during World War II. The United States Army Air Force was not impressed by its performance and cancelled the contract when fewer than half of the aircraft ordered had been produced. Although no P-59s went into combat, it paved the way for another design generation of U.S. turbojet-powered aircraft and was the first turbojet fighter to have its turbojet engine and air inlet nacelles integrated within the main fuselage. Major General Henry H. "Hap" Arnold became aware of the United Kingdom's jet program when he attended a demonstration of the Gloster E.28/39 in April 1941. The subject had been mentioned, but not in depth, as part of the Tizard Mission the previous year. He requested, and was given, the plans for the aircraft's powerplant, the Power Jets W.1, which he took back to the U.S. On 4 September, he offered the U.S. company General Electric a contract to produce an American version of the engine. On the following day, he approached Lawrence Dale Bell, head of Bell Aircraft Corporation, to build a fighter to utilize it. Bell agreed and set to work on producing three prototypes. 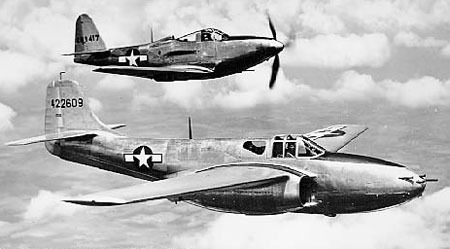 As a disinformation tactic, the USAAF gave the project the designation "P-59A", to suggest it was a development of a completely unrelated Bell "XP-59" fighter project that had been canceled. The design was finalized on 9 January 1942, and construction began. In March, long before the prototypes were completed, an order for 13 "YP-59A" pre-production machines was added to the contract. Bell XP-59 wind tunnel model. Original pusher-propeller design. On 12 September 1942, the first XP-59A was sent to Muroc Army Air Field (today, Edwards Air Force Base) in California by train for testing, taking seven days to reach Muroc. While being handled on the ground, the aircraft was fitted with a dummy propeller to disguise its true nature. The aircraft first became airborne during high-speed taxiing tests on 1 October with Bell test pilot Robert Stanley at the controls, although the first official flight was made by Col Laurence Craigie the next day. A handful of the first Airacomets had open-air flight observer stations (similar to those of biplanes) later cut into the nose; over the following months, tests on the three XP-59As revealed a multitude of problems including poor engine response and reliability (common shortcomings of all early turbojets), insufficient lateral stability, i.e., in the roll axis, and performance that was far below expectations. Chuck Yeager flew the aircraft and was dissatisfied with its speed, but was amazed at its smooth flying characteristics. Nevertheless, even before delivery of the YP-59As in June 1943, the USAAF ordered 80 production machines, designated "P-59A Airacomet". First production P-59A with a P-63 behind. The 13 service test YP-59As had a more powerful engine than its predecessor, but the improvement in performance was negligible with only a five mph increase in top speed and a decrease in service-before-overhaul time. One of these aircraft, the third YP-59A (S/n: 42-22611) was supplied to the Royal Air Force (RAF), receiving serial RG362/G, in exchange for the first production Gloster Meteor I, EE210/G. British pilots found that the aircraft compared very unfavorably with the jets that they were already flying. (The YP-59A also compared unfavorably to the propeller-driven North American P-51 Mustang.) Two YP-59A Airacomets (42-108778 and 42-100779) were also delivered to the U.S. Navy where they were evaluated as the "YF2L-1" but quickly found completely unsuitable for carrier operations. Faced with their own ongoing difficulties, Bell eventually completed 50 production Airacomets, 20 P-59As and 30 P-59Bs. Each was armed with one 37 mm M4 cannon and 44 rounds of ammunition and three .50 cal. machine guns with 200 rounds per gun. The P-59Bs were assigned to the 412th Fighter Group to familiarize AAF pilots with the handling and performance characteristics of jet aircraft. By 1950, all examples of the Airacomet were no longer airworthy. Over time, disposal of the aircraft included use as static displays, instructional aids in military training and use as static targets. While the P-59 was not a great success, the type did give the USAAF experience with the operation of jet aircraft in preparation for the more advanced types that would shortly become available. P-59A Airacomet with the short-lived red outlined National markings (June 1943 to September 1943). Unrelated piston engine powered pusher propeller design developed from the Bell XP-52. Not built. Prototype of the jet engine powered version, three built, serial numbers 42-108784/108786. Series of test aircraft, 13 built, serial numbers 42-108771/108783. Two YP-59A (42-108778/108779) delivered to the US Navy for carrier evaluation as Bu63960/63961. First production version, 20 built, serial numbers 44-22609/22628. Improved P-59A. 80 aircraft ordered but only 30 built, serial numbers 44-22629/22658, further 50 (44-2659/22708) canceled. Royal Air Force received one aircraft, becoming RG362/G, in exchange for a Gloster Meteor I EE210/G. Six P-59s are known to survive today. 42-108784 - National Air and Space Museum in Washington, DC. 44-22614 - March Field Air Museum in Riverside, California. 44-22656 - Pioneer Village (Nebraska) in Minden, Nebraska. 44-22650 - National Museum of the United States Air Force at Wright-Patterson Air Force Base near Dayton, Ohio. 42-108777 - restoration to flying condition by Planes of Fame Museum in Chino, California. Bell YP-59A in flight. X and Y aircraft had rounded vertical stabilizers and wingtips while the production A and B models had squared surfaces. The YP-59A can be distinguished from the XP-59A because Ys had nose armament. ↑ 1.0 1.1 Air International March 1980, p. 133. ↑ Donald 1995, p. 13. ↑ Green 1961, p. 19. ↑ "Gloster Meteor." Flight, 27 May 1955, p. 727. ↑ "Bell XP-59A Airacomet." Smithsonian National Air and Space Museum. Retrieved: 15 December 2011. ↑ "XP-59A Airacomet/42-108784" National Air and Space Museum Retrieved: 14 December 2010. ↑ "P-59A Airacomet/44-22614" March Field Air Museum Retrieved: 10 April 2012. ↑ "P-59B Airacomet/44-22633" John Weeks Retrieved: 14 December 2010. ↑ "P-59B Airacomet/44-22656" John Weeks Retrieved: 14 December 2010. ↑ "P-59B Airacomet/44-22650" National Museum of the United States Air Force Retrieved: 10 April 2012. ↑ "YP-59A Airacomet/42-108777" Planes of Fame Museum Retrieved: 10 April 2012. ↑ Angelucci and Bowers 1987, p. 50. "Airacomet... a jet pioneer by Bell". Air International, Vol. 18 No. 3, March 1980, pp. 132, 139. Bromley, UK: Fine Scroll. ISSN 0306-5634. .
Andrade, John M. U.S. Military Aircraft Designations and Serials since 1909. Earl Shilton, Leicester, UK; Midland Counties Publications, 1979. ISBN 0-904597-21-0. Angelucci, Enzo and Peter Bowers. The American Fighter. Yeovil, UK: Haynes, 1987. ISBN 0-85429-635-2. Baugher, Joe. "Bell P-59 Airacomet". USAAC/USAAF/USAF Fighter and Pursuit Aircraft: Original Fighter Series-1922 to 1962, 27 June 2002. Retrieved: 15 December 2010. Carpenter, David M. Flame Powered: The Bell XP-59A Airacomet and the General Electric I-A Engine. Boston: Jet Pioneers of America, 1992. ISBN 0-9633387-0-6. Green, William. War Planes of the Second World War, Volume Four: Fighters. London: MacDonald & Co. (Publishers) Ltd., Sixth edition 1969, First edition 1961. ISBN 0-356-01448-7. United States Air Force Museum booklet. Dayton, Ohio: Air Force Museum Foundation, Wright-Patterson AFB, Ohio, 1975. 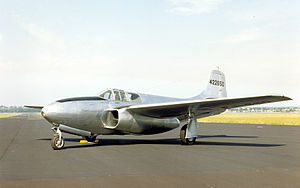 Wikimedia Commons has media related to P-59 Airacomet.